What Drives District Retail? Household or Business Purchases? Sales tax returns data show that the District’s retail sector has grown in importance since 2001. This may not be accidental. Attracting retail to the District has been a focus of District policymakers in recent years. But the data also shows that since the Great Recession, which lasted from December 2007 to June 2009, growth in the sector has slowed. As such, tracking the trends in the sector and understanding the forces driving these trends could better inform policymaking. In a newly issued report, we use sales tax returns for fiscal years 2001 to 2014 to investigate annual trends in retail sales tax receipts over the period. The analysis categorizes the top 50 retail sales tax returns by revenue each fiscal year into two broad categories of purchases: household and business. We focus on the top 50 retail sales tax filers because the coding for industry sector on the raw returns data is unreliable and re-coding the entire database of tax returns would be tremendously time-consuming. Figure 1 shows that in FY 2014 retail sales taxes paid by the top 50 tax filers was about $130 million compared to about $470 million in total retail sales tax filers. That is, the top 50 filers paid about 28 percent of all the retail sales tax receipts. This share did not change by much over the period covered by the analysis. In FY 2001, the top 50 retail sales tax filers paid about $110 million compared to $330 million for all retail sales tax filers, or about a third of all retail tax receipts. Figure 1 also shows that, for the period FY 2001 – 2014, the pattern of growth of retail sales tax receipts from the top 50 filers was roughly similar to the pattern of growth of total retail sales tax receipts: retail sales tax receipts of the top 50 filers grew when overall retail sales tax receipts grew and slowed when growth of overall retail sales tax receipts slowed. However, growth rates of retails sales tax receipts for the top 50 was different from growth rates of overall retail sales tax receipts. Table 1 shows that prior to the Great Recession annual average growth of retail sales tax receipts from the top 50 taxpayers was 3.7 percent compared to annual average growth of 5.3 percent for the total retail sales tax receipts. The period during and after the recession (FY 2007-2014) the annual average growth of receipts from the top 50 taxpayers grew about 2 percent, while receipts from all other taxpayers was slightly negative. For the entire period the annual average growth of retail sales tax receipts from the top 50 taxpayers was 1.3 percent compared to annual average growth of 3.3 percent for total retail sales tax receipts. For a closer examination of the underlying trends in the District of Columbia’s taxable retail sector, the city’s top 50 retail sales filers are classified by their respective North American Industry Classification System (NAICS) industry grouping. These industries are further grouped into two categories: Household or Business. Sales tax returns from sectors more likely to sell to households for final consumption are classified as Household, while sales tax returns from sectors more likely to sell to businesses for final consumption or as inputs to the production of other goods and services are classified as Business. Figure 2 shows that, of the top 50 sales tax filers, those selling primarily to businesses outnumbered those selling primarily to households for 10 of the 14 years of the study. In FY 2001, 26 out of the top 50 sales tax filers sold primarily to businesses; this rose to 28 in 2002. For years 2003 to 2006 there was more or less an even number of sales tax filers selling primarily to businesses as those selling primarily to households. From FY 2007 to 2014 sales tax filers selling primarily to businesses again outnumbered those selling primarily to households, with only 20 of the top 50 filers selling primarily to households in FY 2014. Figure 2 also shows that, since the recession, the margin by which the number of filers selling primarily to businesses exceeds the number selling primarily to households has increased. This is somewhat surprising as the story of the District since the recession is the increase in population, with the new residents being younger and relatively richer. Given the population growth one would expect relatively faster growth in the number of filers selling primarily to households. Online shopping may be the missing factor here. Until this fiscal year, e-commerce filers were excluded from the sales tax base, and the new residents are in the demographic of those more likely to be online shoppers. The distribution of retail sales tax filers between household and business purchases yields useful insights, but ultimately we are interested in the relative amount of retail spending by the two groups. So let us turn to the relative spending by households and businesses as measured by retail sales tax receipts. Figures 3 and 4 show that between FY 2001 and 2014, except for fiscal years 2003 through 2006, when retail sales tax receipts from business and household purchases were more or less even, among the top 50 sales tax filers business purchases accounted for more of the receipts than household purchases, both in levels and as a share of the total. Figure 3 also shows that the business purchases component of the retail sales tax is more stable than the household purchases component. While the household purchases component fell steeply in FY 2007 at the onset of the Great Recession, the business purchases component actually rose slightly. The household component rebounded in FY 2008, but fell back the following year to its FY 2007 level and has since remained below its pre-recession peak. The business purchases component also fell in FY 2009, but not as steeply as the household component. Since the recession the business purchases component has been more or less stable, except for FY 2011, when both it and the household component fell. This followed the passage of the federal Budget Control Act of 2011, which mandated federal budget cuts to reduce the deficit by $1.2 trillion over ten years. The business purchases component recovered in FY 2012 to about the level it was in FY 2010 levels and has remained relatively flat since. While the household component has not returned to pre-recession levels it has grown in the last 3 years. So what’s driving the trends in the relative growth of the household and business purchases components of the retail sales tax? One place to look is federal spending. As the largest single employer in the District, the federal government plays a large role in the District’s economy. Although federal government purchases are not taxable, federal spending flows through to households and businesses whose purchases are taxable, so shifts in federal spending may lead to shifts in the household/business composition of District sales tax receipts. The line graph in Figure 3 shows the level of federal nondefense spending over the FY 2011 – 2014 period. It shows that prior to the recession, both the household and business components of sales tax receipts grew along with nondefense federal spending. After the recession, changes the business component, which was never hit hard by the recession, continued to mirror, more or less, changes in federal nondefense spending, including the flattening after the implementation of the Budget Control Act of 2011 that curbed the growth in federal spending. The household component, which was hit harder by the recession, seems no longer tightly linked to changes in federal spending. One reason for this change may be that, post-recession, District residents, who in recent years have become younger and hipper, are bargain shopping on-line to a greater degree at the same time that the choices for on-line shopping have been expanding. But data to confirm this is scarce. If, in fact, greater on-line shopping is the cause of the post-recession fall off in sales tax receipts from the household component, the recent expansion of the retail sales tax base to include some large e-commerce entities portends well for future growth of the household component, and a brighter future for retail sales tax overall. Our data on sales tax is from Office of Tax and Revenue sales tax returns. Sales tax returns categorized as Household sales are ones with the following industry classifications: department store retailers, clothing retailers, home supplies/furnishings retailers, electronic retailers, grocery stores, pharmacies/drugstores and book stores. Business sales tax returns have the following industry classifications: office equipment/materials suppliers and services, construction equipment/materials suppliers, building maintenance services, telecommunication and energy supplier/service retailers, and publishers. Data on federal spending is from the U.S. Bureau of Economic Analysis, Federal Government: Nondefense Consumption Expenditures and Gross Investment [FNDEFX], retrieved from FRED, Federal Reserve Bank of St. Louis; https://fred.stlouisfed.org/series/FNDEFX, March 14, 2017. The bulk of sales tax revenue reported by the District’s largest telecommunication and energy supplier/service retailers are from their business/industrial customers. Last week, we presented an overview of the effects of DC’s $15 minimum wage (full paper). Part two of our analysis focuses on “The Commuter Effect”. DC is surrounded by higher population jurisdictions that have increasingly lower minimum wages when compared to DC. This incentivizes more nearby Virginia and Maryland residents to compete for employment in DC. The result of this competition will force some DC residents who previously would have been able to find jobs in DC to have to look elsewhere. As the above chart shows, DC residents make up half of those working in DC and earning $12.50/hour or less. They make up a much smaller percent of those working outside DC. As DC’s minimum wage continues to increase to $15/hour, the group working outside DC will have greater and greater incentive to find work in DC. This will change the proportion of those “Working in DC” to look more like the group that is currently “Working Outside DC,” and that means proportionally fewer DC residents. The commuter effect is the main reason that DC residents will lose 82% of all jobs lost in DC due to the minimum wage increase. Our model predicts by the year 2026, 2,489 total jobs will be lost, with 2,046 of those jobs previously being held by DC residents. Without the commuter effect, our model still estimates that there would be job losses as businesses and consumers react to changes in prices due to the minimum wage increase, but the commuter effect concentrates the losses on DC residents. American Community Survey data was used to show where people live and work in the DC area. For a similar take on this data, see our previous post on DC workers and where they come from. The District of Columbia Public Library (DCPL) Books From Birth program mails all enrolled children in D.C. a free book each month from birth until they turn five. The program was launched by DCPL in January 2016 in partnership with Dolly Parton’s Imagination Library. The program just celebrated its one year anniversary, and we thought it would be interesting to see how the program is performing now that participation data is available. Shelby County, Tennessee, which includes Memphis, is an urban area that has been operating a program like D.C.’s since 2005. Shelby County has a population of 937,750 (657,167 residing in Memphis) and generally speaking has similar demographics to the District. 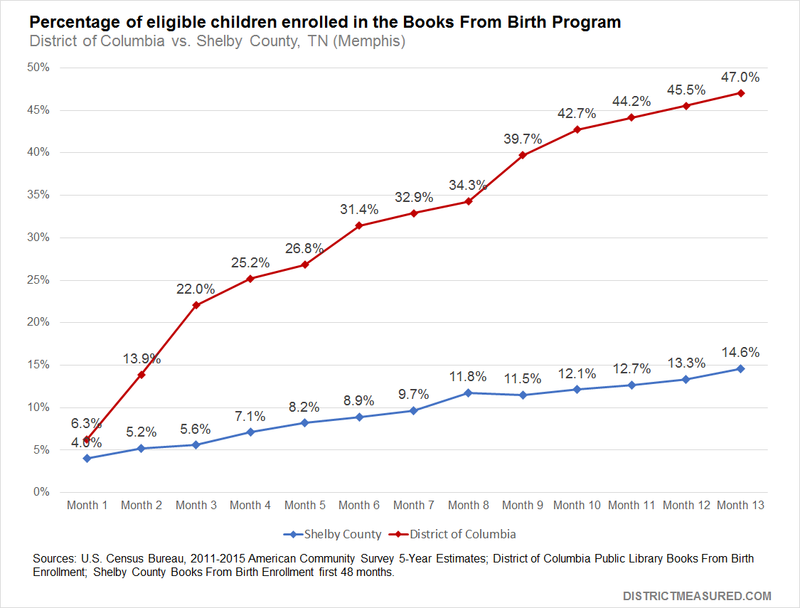 The data shows that D.C.’s Books From Birth program outpaced Shelby County participation by about 300 percent and had more than double the number of enrolled children at the conclusion of month thirteen. The District enrolled more children in total even though Shelby County has 67,000 children under five years old compared to the District’s 40,400. We speculate that D.C.’s higher enrollment figures could be related to the fact that DCPL implemented an aggressive promotional campaign. DCPL’s campaign included posters on public transit and outreach at neighborhood festivals, DCPS parent meetings, nonprofit and government agencies, and daycare providers. Shelby County did not ramp-up its promotional outreach efforts until several years into the program and did not simplify its enrollment application until 2011. Shelby County saw swift growth in enrollment once outreach efforts were expanded. The program currently has 44,250 program participants and a 66 percent participation rate. 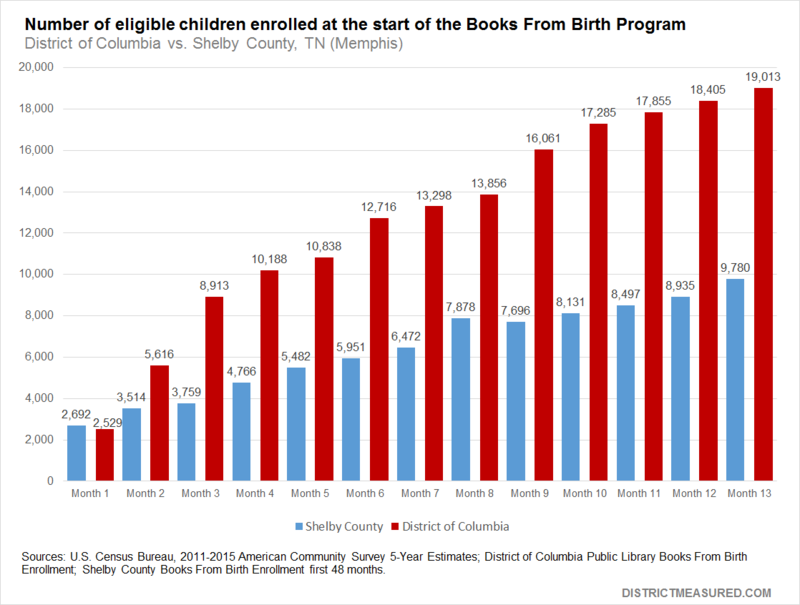 Our data on Books From Birth participants comes from the data reported to us by the District of Columbia Public Library. This included the birth years for all participants, zip codes for mailing address, and enrollment numbers for each month of the program. We excluded zip codes with under 50 participants since many were not a physical location but rather a zip code for P.O. boxes. Excluded zip codes are included in the total enrollment and participation numbers but not the participation by location analysis. The data regarding Shelby County was provided by the Executive Director of the Shelby County Books From Birth, Jamila Wicks. 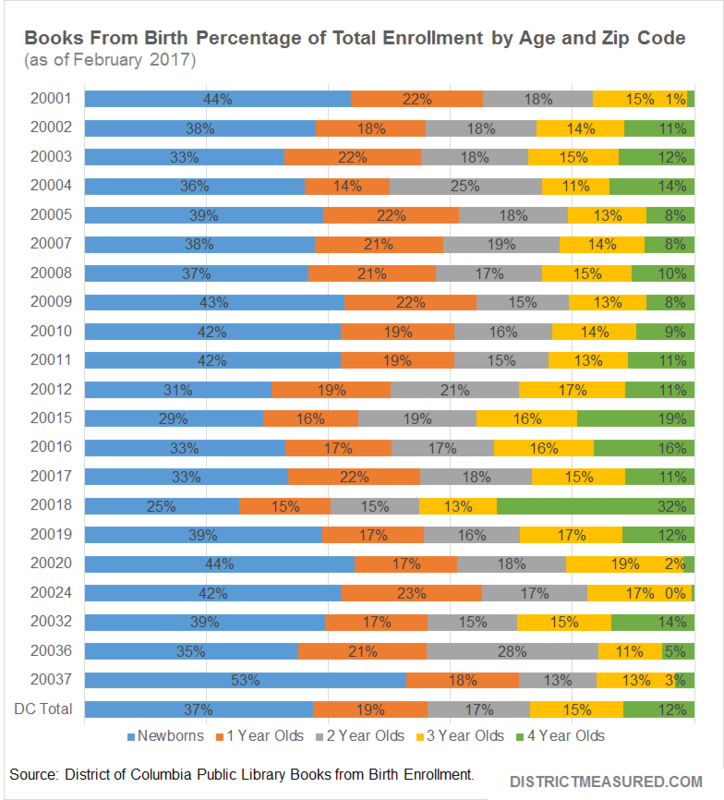 Our data on the number of eligible children by zip code and demographics for Shelby County and D.C. comes from the 2011-2015 American Community Survey five-year estimates for number of children under five years old by zip code.